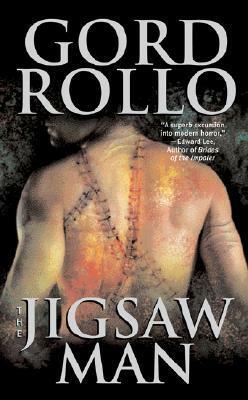 Gord Rollo‘s first novel The Jigsaw Man (2008, originally published in 2006) is a quintessential Leisure book: lean, mean and somewhat meaningless. This isn’t to say The Jigsaw Man is a bad book, far from it. It’s a well-written, well-plotted, fast-paced thriller that offers a good portion of both traditional and new horror imagery. Leisure Books was, of course, a long-lived publisher of massmarket horror paperbacks that went defunct amidst a mess of unpaid royalties in the late 00s. In their time they produced a line of surprisingly uniform horror novels, all about 300 pages, with striking but somewhat formulaic cover designs. Despite the uneasy sense that it all feels a little too mass-produced, there was also an undeniable appreciation and knowledge of the genre at the publisher. They put out a fair number of affordable reprints of out-of-print novels or works that previously only appeared in small press (such as The Jigsaw Man). They introduced a great many new writers to the public at large. All the novels I’ve read have been well edited (it’s not that surprising to learn that Don D’Auria, the editor at Leisure, is now working at Samhain Publishing, which puts out similarly good quality horror books), and some of the reprints have included additional material, such as a related short story (as in Jack Ketchum‘s Off Season). That’s a far cry from a slapdash assembly line. But still, many of the titles don’t seem to rise above their nature as easy-to-read paperbacks; maybe that’s why they were called Leisure books. For example, Brian Keene‘s The Conqueror Worms or Ronald Malfi‘s Snow are fun reads, but there’s very little that sticks in mind afterwards. The Jigsaw Man fits in the same category. It’s the story of a homeless drunk on the brink of suicide who gets a strange offer at the very last minute: give up your right arm, and you get two million dollars. Initially hesitant, Michael, the protagonist, ultimately agrees and is taken to a remote medical facility. There he meets other willing donors, each giving up a different limb for some cash. A genius doctor behind the strange offer explains that he’s perfected a way to transfer limbs from one human to another, in order to help his son, who never had any because of thalidomide. Yes, it all stinks to high heaven, but with nowhere to go, the characters decide to ride it out. Bad move, it appears, since the doctor wasn’t telling the whole truth. In his nightly excursions around the private hospital, Michael discovers that the doctor’s son is in fact a plastic dummy, and that there is a group of limbless men used as a bloodbank on the fourth floor. And it only gets crazier, a lot crazier. The title The Jigsaw Man is a good indication of what’s in store for Michael. For most part it’s an adrenaline-filled rush, with Michael constantly escaping or climbing a trellis or plunging down waste disposal chutes, either with arms or without, in his own body or in a pieced-together monstrosity. The chapters are short and they often end with a bang, effectively whetting the reader’s appetite for more. There are also nice details that bring depth to the story when one least expects it – for instance, the reason why one and possibly more members of the staff work for such a strange and ethically dodgy doctor, and the way Michael realizes that going to the authorities would just mean becoming a guinea pig for more medical experimentation. Medically it’s all glorious nonsense, in the great tradition of Frankenstein. The doctor carrying out the dubious experiments is an archetype, the Insane Scientist. He’s completely off his rocker, and so is his strangely horny security chief. Their experiments are creepy and horrific, but there isn’t really anything more to them, there are no further revelations to be had. It’s a rollercoaster for sure, but like a rollercoaster it stays rather predictably on track – perhaps it feels a bit too safe for a horror novel, even if it does feature some quite bravely strange imagery. Still, it’s great fun to read about Michael’s skewed fate that continually goes from bad to worse (out of the frying pan and straight into Hell, as he observes in the novel). And there’s nothing wrong with a book that’s just out there to entertain, and as said, it’s in good company.